Because you want (need) to know who you are trusting your event to!! Company profile: Wild Diamonds Fun Casino is a business which has been carefully formed to fill in a “gap” in the party/event entertainment industry. We (the owners) have worked for other fun casino companies and learned from their (the other companies) mistakes. To provide exceptional entertainment, we use the highest quality equipment which has been specially designed for this business by us. We take a lot of pride in how we operate our business and our many satisfied customers are proof of that. You will find that we have kept to the original casino style of gaming table, with high quality timber finishes and bright, outstanding layouts. All tables are also the same size and height that you will see in any real casino in Australia. Our chips are heavyweight chips for the genuine casino feel and sound. As well as top quality equipment, we have real dealers with real casino experience. Every effort is made to ensure your night is a success. Wild Diamonds take ownership in your event to ensure every detail is covered, no short cuts. As owners, we are involved every step of the way from first contact to the final hand of the night, and will be personally involved with every event to ensure all runs smoothly. Wild Diamonds do not accept jobs if we can not handle them personally, so when you enquire with other companies, ask them if the owner is involved, or just handing it off to one of their workers to run. Some companies say they are local, but just have a P.O. box in Queensland and have workers whom they have never even met running their shows (One of these companies used to use us to manage their business, we never met the owner). We believe that being a small local business gives us an advantage which allows us to offer a more personalised and flexible service which the bigger companies do not offer. Bigger is not necessarily better, so for a Diamond Class Event, you need Wild Diamonds Fun Casino. With Wild Diamonds, your party will become an event. Lucy & Ian Hazzard, Owner / Operators. You will often find it very hard to find the owners of other Fun Casino Businesses. We own the business and will be present and running the tables at most events. We will be involved in the management of your event, no matter the size, from beginning to end. Many of our competitors websites will not identify the owners. We are based and live on the Sunshine Coast and also operate a local cartridge supply business called Captain Cartridge. We are involved with many Sunshine Coast sporting clubs as well as holding voluntary positions such as P&C treasurer and Buddina State School banking officer for 8 years. When you deal with us you will be treated as an individual, nothing will be too much trouble. Lucy has worked in several casinos since 1987, including The Adelaide Casino, Diamond Beach Casino in Darwin & Lassetters Casino in Alice Springs. Lucy has also been the owner / operator of 3 successful businesses over the last few years. Previously, Lucy had a successful career in the banking sector holding managerial positions within Westpac in South Australia. Lucy then moved on to be the Branch manager for Suncorp Earlville, Cairns, prior to resigning to start her first business venture. Ian has also worked in several casinos since 1985. Some positions include: as part of the management team responsible for the opening and successful operation of Crown Casino Galleria and then Crown Casino Southbank. These casino’s are also known as Melbourne Casino or Crown Resorts. training officer in charge of training staff for the opening of Crown Galleria. Pitboss VIP, responsible for gaming operations and VIP customer service. Shift manager main floor: responsible for operation of an area of the casino, including staff management, dispute resolution & surveillance. After a successful career starting prior to his 18th birthday and including positions of Main Gaming Floor Shift Manager and VIP Room Pit Boss, Ian left the casino industry in 2000 to own and manage his own businesses in Queensland. 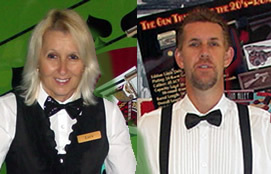 Both Lucy and Ian have a huge amount of experience in Casino operations. They also have a proven ability to manage successful unrelated businesses. They both value excellent customer service and will always go the extra mile and be flexible toward meeting the needs of their customers. Lucy and Ian’s other business is Captain Cartridge founded in 1999 and based from their home at Kawana Island. They offer discounted price cartridges and toners with free delivery. Please go to www.88inks.com.au for more info. Lucy Hazzard & Ian Hazzard. Wild Diamonds Fun Casino is the only Fun Casino business that is owned and operated on the Sunshine Coast. Word is quickly spreading about the exceptional quality & service that we provide, so we are now also operating in Brisbane and the Gold Coast due to popular demand. We have also travelled as far as Roma and Bundaberg by request. If you know of any company or private functions being planned, please let them know about us. They will thank you for it after.